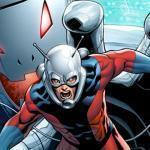 TV and Film Is Marvel Viewing Ant-Man As An Afterthought? Discussion in 'General Discussion' started by Todd Black, Apr 12, 2015. Is Marvel Viewing Ant-Man As An Afterthought?